I just got back from a fabulous family vacation and feel very relaxed and inspired. The mountains and wilderness were just breathtaking. All this natural beauty inspired me to make this card. I used the Noble Deer stamp set from Stampin' Up and the rest is a sponging technique. I used several masks on the deer, sun and to the make the distant mountains. I am definitely not an artist so this is my best shot of a mountain lake and wildlife. Inspiration can come from anything - just keep your mind and eyes open. 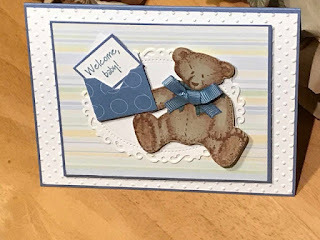 You will be making one of kind cards in no time.